Walter Langley was born in Birmingham on June 8, 1852 one hundred and sixty-five years ago today. He studied at the South Kensington Schools and then worked for a firm of lithographic printers before gaining a reputation in Birmingham as a watercolourist. Why did he migrate from the Midlands to Cornwall? He first visited Newlyn in Cornwall with his friend William Pope for a sketching holiday during the summer of 1880. He was the first artist to recognise the potential of Newlyn as a subject for his paintings and returned in 1881 to fulfil a commission for twenty Newlyn paintings. It must have been this commercial success that led him to take a lease on Pembroke Lodge, on the southern edge of Newlyn Town, and become the first of the emerging colony of artists to set up home at Newlyn. Pembroke Lodge was a grand house that had been home to bankers and gentry since it was built in 1791.Langley’s first year’s rent of £62 (payable in advance) gave him two parlours, two kitchens, a dairy, pantry, four good bedrooms, and a dressing room. It also had a studio in the garden. The house was a good size for Langley, his wife Clara and their four children who moved into their new home in March 1882. Clara had not long given birth to her fourth child, a son Cecil born in February that year. The other children were son Lorraine (born September 8, 1877), daughter Eleanor (born March 15, 1879) and son Gabriel (born November 21, 1881). Although from a less privileged background than many of the artists who came to Newlyn (his father was a tailor), when he settled there at the age of 30, Langley was a successful professional artist making a good living selling his watercolours. In this, he was different from most of the artists who joined the Newlyn colony later, as they used oil paint, which was considered by the main art institutions of the day to have primacy. In 1883 Langley’s Newlyn picture, Time moveth not, our being ’tis that moves, led to him being elected to the Royal Institute of Painters in Water Colours. That year he recorded every modelling session in his diary, named the models and itemised the fees paid, 6d per session to a man or woman, half that to a child. The models used in 1883 were Catherine Rosewarne, Charles Jenkin, Jack Cotton, Annie Ellis, Betsy Lanyon, Sarah Madden, Annie Warren, Grace Kelynack, Lilly Rowe, Caroline Rowe, John Jenkin, Mary James (a little girl), Sarah Stevenson, Mr Sampson, Mrs Marks, Ethel Runnalls, Charles Strick, Mr Fender, Blanche Courtney and Mr Beckerleg. Langley left Newlyn at the end of 1885(although he returned for a short time at the beginning of 1886 to complete a picture, lodging in Penzance and using Ralph Todd’s studio). Up until 1885, the Newlyn colony was in its infancy, but for the art media, someone had to dominate and until he left Langley (alongside Forbes and Bramley) emerged as a leader. 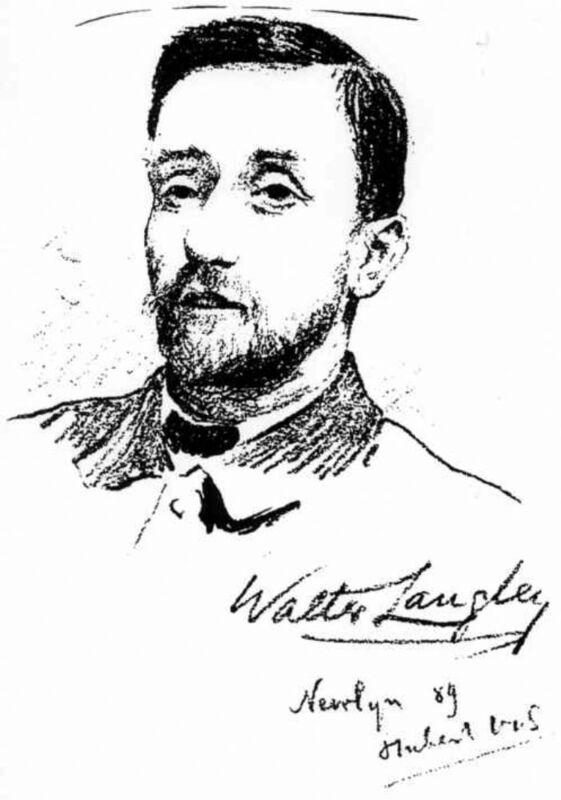 Walter Langley, from a chalk drawing by Hubert Vos. From Newlyn and the Newlyn School, Magazine of Art, 1890. After a 2-years absence in Birmingham, Langley returned to Cornwall the Spring of 1887. Finding nowhere suitable in Newlyn, he took accommodation in Penzance. But his models and subject matter were still in Newlyn, so he purchased a cottage in the Fradgan and set about making it into a studio. In June 1890, he brought his family back to Newlyn, taking a two-year lease on Pembroke Lodge, and again becoming a prominent member of the colony. In 1892, the family moved to Penzance and Langley’s reputation went from strength to strength. In 1894, he participated with other Newlyn artists in the exhibition Painters of the Newlyn School at Nottingham Castle. This was the zenith of the Newlyn Colony’s achievements. In 1895, when Langley’s wife Clara died at the age of 45, leaving Langley a widower with four children, he stayed in Cornwall. In 1896, he was part of the deputation of the most senior members of the colony, along with Gotch, Bramley and Forbes who persuaded John Passmore Edwards, a generous philan­thropist of the time, to provide the finance for the first art gallery in Cornwall. He was already working on his large painting Breadwinners, which made necessary the rebuilding of his cottage in the Fradgan, gutting it to make one large studio room with glass front. Langley married his second wife Ethel Pengelly In St Johns Parish Church Penzance on 24/6/1897. He died in Penzance on March 22, 1922.